Born in Chicago, Illinois, on June 28, 1924, to Blanche J. Nelson and Carl Theodore Nelson, young Fielding attended school in Chicago and graduated from Schurz High School June 1942. He entered The Citadel at Charleston September 1942. During his brief time at the military college, he was a member of Cadet Company A until his call to active duty as an enlisted reservist March 3, 1943. 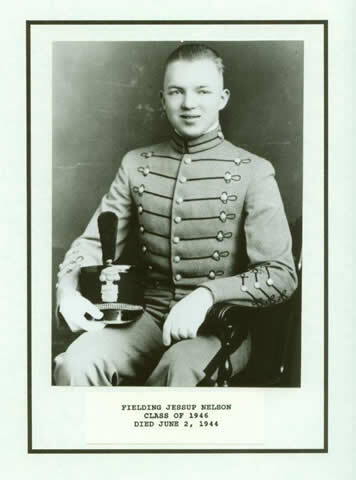 Overseas in Italy, Private First Class Nelson served with Company E, 30th Infantry Regiment, 3rd Infantry Division. Twenty-six days short of his twentieth birthday, PFC Nelson was killed in action on June 2, 1944, in the vicinty of Palestrina, Italy, 63 km north of Anzio, 40 km east of Rome. He was buried at the U.S. military cemetery at Nettuno. This cemetery was later made into the permanent Sicily-Rome American Cemetery maintained by the American Battle Monuments Commission. Four of Fielding’s Citadel classmates rest in eternal peace at the cemetery. Following the war, per his family’s wishes, his body was repatriated and interred at Memorial Park Cemetery, Skokie, Illinois. He was survived by his parents and older brother, Carel T. (Ted) Nelson. This entry was posted on June 2, 2018 by Roger Long. It was filed under Sicily-Rome, WWII and was tagged with 30th Infantry Regiment, 3rd Infantry Division, Anzio, History, Sicily-Rome American Cemetery, The Citadel, WWII.